BRS helps leaders in corporations and government agencies run a smart, adaptable business by enabling them to identify and close gaps in operational compliance, communication, and knowledge critical to their success. The diagrams situate BRS in the context of the larger world and illustrate the central role it plays in how corporations, governments, and target markets interact. 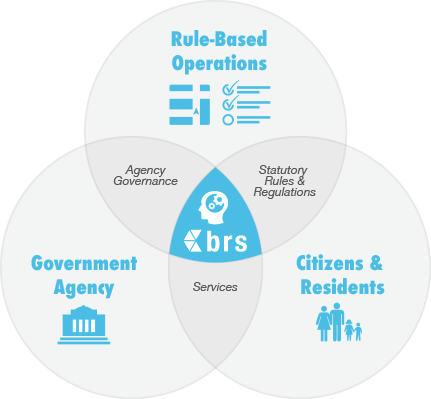 BRS sits at the crucial intersection where it guides corporations and governments in establishing rule-based operations that enable world-class compliance and adaptability. For as long as there has been commerce, rules have always occupied a critical space at the intersection of companies and target markets. Whether or not leaders are attentive to this fact is besides the point. Business rules matter by virtue of the world we live in – a world regulated by governments, governed by rule of law, molded by stakeholder relationships, and based on deep knowledge. Business rules help make sense of it all, and provide clear guidance and a sound, scalable basis for corporations to manage complexity and operate effectively.